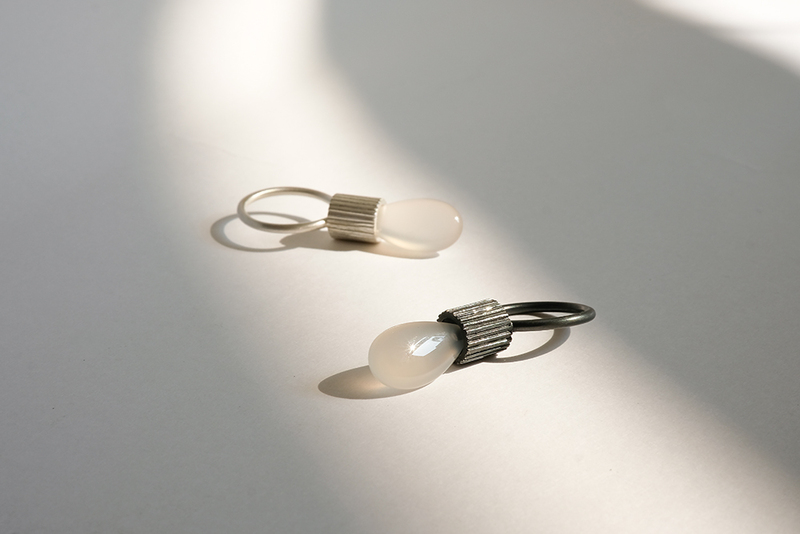 Tactility born from the cactus family, this collection explores the tactile possibilities of contemporary wearables. Pertaining to the Designer’s floral motifs that threads all of her creations, Cactile Collection takes inspiration from the scabrous surface of cacti. By employing the traditional metal-smithing techniques such as punching and forming, the precious metal is transformed into hollowed organic structures with a rich tactile quality. The embossed markings produce a remarkable sight to behold, and a meditative work process for the creator, finding inner peace at every strike of the steel punch. The avant-garde approach to jewellery results in an amusing aesthetic that in itself is an invitation to approach. This Palm leaf ring, hand fabricated in fine silver, dons the linear pattern reminiscing of its namesake. The ring’s hefty appearance will surprise you with it’s physical lightness, leaving a remarkable impression.